July 31, 2018, 8:51 a.m. The Sims is a life simulation game centred on the lives of virtual people (Sims) living in a simulated neighbourhood. Unlike other video games, which focus on more action-packed pursuits like shooting bad guys, attempting to win the Premier League or racing go-karts, users are tasked with managing the day-to-day lives of their Sims. They choose their career path, their friends, create families and build houses. But more devious players can also neglect their Sims, use cheats to get more money and – by accident or on purpose – kill them. Now new YouGov research has uncovered how the 22% of Brits who have ever played The Sims handled the absolute power they were given over their digital wards’ lives. 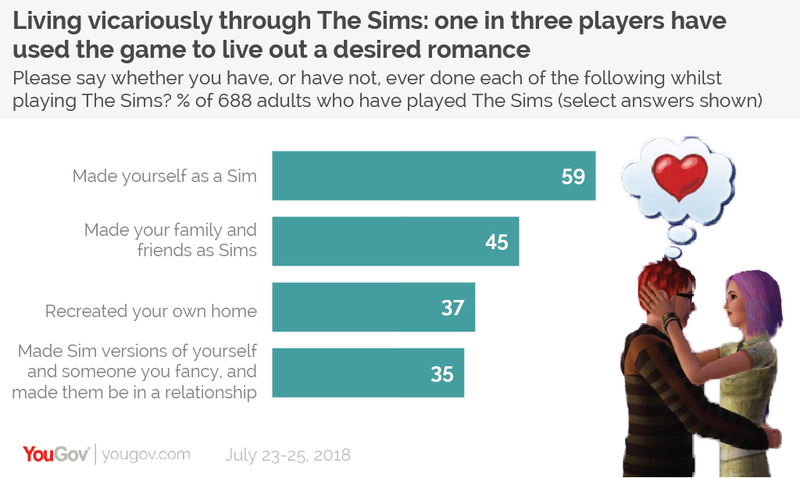 While The Sims is supposed to be about players nurturing the lives of their characters, 41% admit to having driven Sims to their deaths instead. A further third (32%) have also extended their killing sprees to other Sims in the neighbourhood. The survey has also revealed players’ favourite death sentences. Drowning in swimming pools proved the most popular, with 30% of players subjecting their Sims to death in a pool prison by removing the stepladder. Other methods included starting a fire (19%), starvation (12%) and trapping Sims in a room (10%). 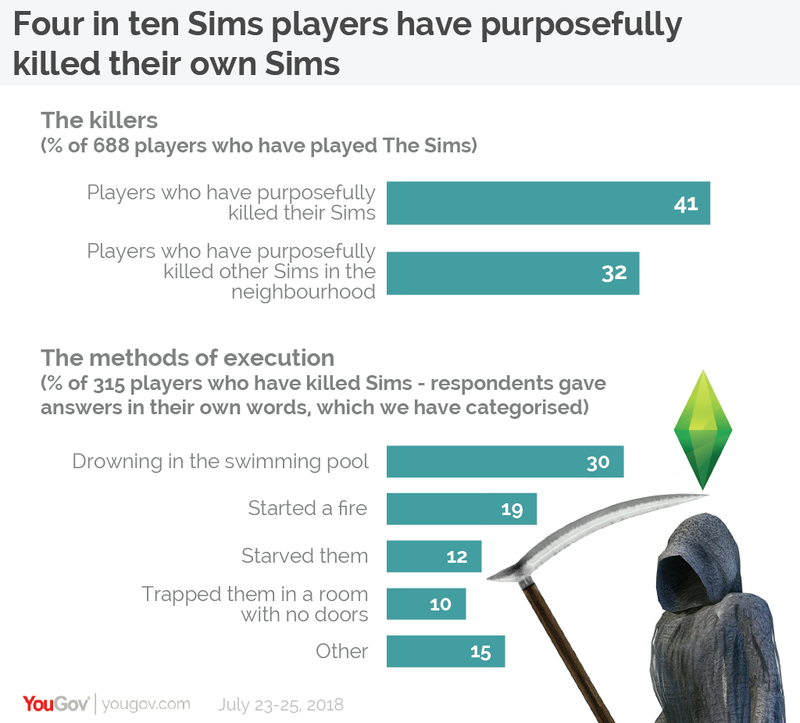 It was also found that female players were more likely kill their Sims, with 46% of females admitting to having killed off their characters compared to 36% of male players. Nonetheless, a clear majority of players have also considered the wellbeing of their Sims, with 58% stating that they have fulfilled their Sims’ aspirational goals, and 69% encouraging them to have a successful career. Living vicariously through a Sim proved popular, with 59% of players stating they had previously made virtual versions of themselves, 45% have created their friends and family in-game and 37% constructed a virtual version of their own home. A third (35%) also admitted to creating their real-life crush in a game and entering their simulated self into a relationship with them. Many players are clearly familiar with the infamous ‘rosebud’ and ‘motherlode’ cheat codes, with 50% admitting to cheating in order to get more money or to manipulate the game in other ways. Younger players are far more likely to have employed shortcuts to success than their elders, with 72% of players under 30 having used cheats before compared to just 29% of those over 30.